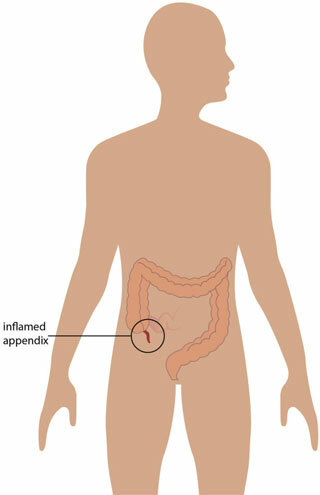 The appendix is a small (finger size), tube-shaped piece of tissue. The inside forms a pouch which opens into the beginning of the large intestine. The appendix is located in the lower right side of the abdomen (belly area). Appendicitis happens when the inside of the appendix becomes blocked by a hard piece of stool (bowel movement), swelling from an infection, or rarely, a tumor. Irritation and swelling from the blockage lead to a lack of blood flow, and then the appendix starts to die. Bacteria then multiply and start to attack the appendix. If the appendix isn’t removed, it’s possible that it may rupture (or burst open), which can cause a serious infection. If you’re having bad pain in your lower belly, it’s important to contact your health care provider right away so he or she can figure out what’s wrong. If you have appendicitis, you’ll need treatment as soon as possible. Although there’s not one “test” for appendicitis, your health care provider will be able to suspect that you may have it. He or she will likely ask you about your symptoms, touch the lower right side of your abdomen, and may perform blood tests or take images by an ultrasound or CT.
Is there a treatment for appendicitis? Yes. If you have appendicitis you’ll need to have treatment as soon as possible. This is because the longer a person waits for treatment, the more likely their appendix is to burst. The way that appendicitis is treated is through an operation called an “appendectomy,” pronounced: app-en-dec-toe-me. There are some research studies in which antibiotics are given for early appendicitis but the symptoms often come back in the next year. After your appendectomy, you’ll have to stay in the hospital, but the length of time depends on whether your appendix burst or not. If you don’t have any complications, you’ll likely just need to stay in the hospital overnight. If your appendix burst or you have a fever, you will need to stay in the hospital a little longer. Your doctor will give you a follow-up appointment so he/she can check to make sure you are healing well. It is very important to keep this appointment. Am I going to be ok without an appendix? Yes. Living without an appendix will not cause any problems. However, it’s important to be excused from gym class, sports, and very physical activity for 2-4 weeks after your surgery. If you’re concerned about appendicitis, here’s a tip on how to bring it up with your health care provider: I have really bad pain on the right side of my stomach, should I come in to your office?